As a guest at the Bay View Resort, you are right in the heart of all of the action along the boardwalk. As soon as you step out the door, you can head north of south and find some great ways to celebrate or relax on your next Myrtle Beach vacation. Second Avenue Pier – Just head south and you are only a few steps away from the Pier View Bar & Lounge on the 3rd level of the Pier House offering 360-degree views. The unique open-air bar concept allows you to take in the views and really relax while sipping a classic margarita. They offer happy hour, live music, appetizers, and drinks, be sure to make this your first stop along the boardwalk. Sharkey's Oceanfront Beach Bar – just head north on the boardwalk and you will next come across this newly renovated beach bar offering live entertainment, DJ's and karaoke all summer long. Great views, tasty drinks, and entertainment that will last into the night. The Bowery – Heading north again, you will run into the heart of the boardwalk with many, restaurants, shops and attractions, but this spot is known as the honky-tonk talk of the town, The Bowery, where country music super-group Alabama served as the house band back in the 1970s. Take in a bit of history, listen to live bands and enjoy some good beer and appetizers. Riptydz Oceanfront Grill & Rooftop Bar – Just past the Myrtle Beach Skywheel is one of the newer members of the Boardwalk, offering 2 levels of fun. Open air atmosphere, great drink specials, and fantastic menu items. Live music, DJ's and of course the rooftop bar with amazing ocean views. 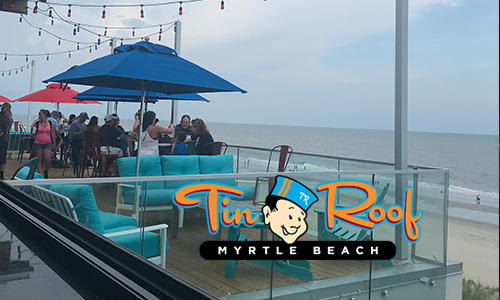 Tin Roof – Located on almost the most northern end of the boardwalk is the new rooftop bar, Tin Roof. If you are looking for the best view in the area, great live music, lots of fun and food, head here. Whether you're coming for the tunes, the food, a drink or just a good time, enjoy the Roof 'Where Everybody is Somebody'! Support live music and the musicians that bring it to us, and we'll hope to see ya enough to call you a Regular! After a fun-filled day or night along the Myrtle Beach Boardwalk, head back to Bay View Resort and begin planning the next adventure with the family.